One of the 20th Century’s finest violinists spent seven years in Ridgefield and brought some of the era’s leading classical musicians to town. Sascha Jacobsen was born 1895 in Helsinki, Finland, then part of Russia, and came to the United States as a boy. He graduated from the Institute of Musical Art, now called the Juilliard School of Music, in 1915 and earned the school’s highest honor, the $500 Loeb prize. Jacobsen performed with the New York Philharmonic, the New York Symphony and the Metropolitan Opera. He toured Europe and North America with pianist Samuel Chotzinoff (who became a longtime Ridgefielder and head of music at NBC — Chotzinoff twice brought conductor Arturo Toscanini to Ridgefield for concerts). 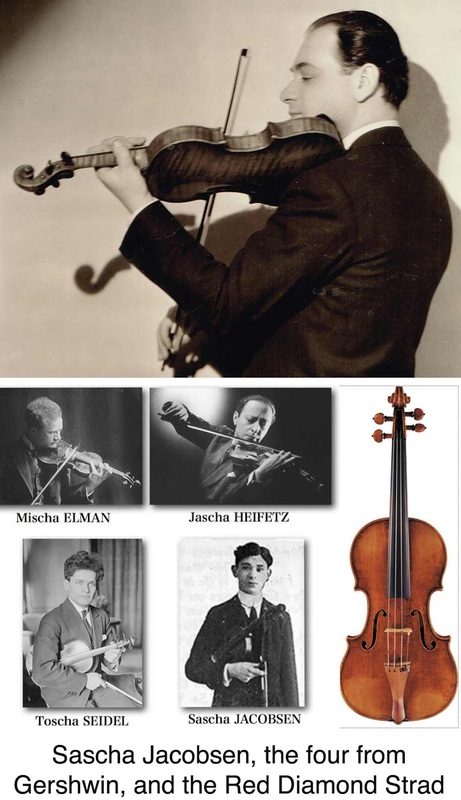 Jacobsen founded the Musical Art Quartet which performed from 1927 to 1933; Jascha Heifetz occasionally appeared with them. In 1926, he became a teacher at Juilliard, succeeding his late instructor, Franz Kneisel, who had died. Over the years many of his students became internationally known concert violinists. He even gave violin lessons to his close friend, Albert Einstein. He also made many recordings, including some 50 solo performances. Jacobsen was probably drawn to Ridgefield through his association with Chotzinoff. However, in 1944, he decided to go west. He resigned from Juilliard, where he had been head of the violin department, sold his house here, and moved to Los Angeles. There he joined the faculty of the Los Angeles Conservatory and did stints as concertmaster of the Los Angeles Philharmonic, under Alfred Wallenstein. It was while he was concertmaster that Jacobsen was involved in an amazing story. On Jan. 16, 1953, he was driving along the coastal highway to Pacific Palisades during heavy rainstorm. On the seat beside him was the Red Diamond Stadivarius in its case. The 1732 violin was famous for its special glow created by an unusual ruby-colored varnish Antonio Stradivari had used on it. The car stalled near Santa Monica and water from an overflowing stream began rising around the vehicle. Jacobsen grabbed his violin case, escaped from the car, and struggled through the rising torrent to reach higher ground, but the violin was swept from his arms and carried toward sea. “He watched, helpless, as the violin case floated away,” according to an account of the event. The next morning, a Los Angeles attorney named Frederick Sturdy was walking along a beach and spotted a violin case stuck in the sand. “Inside the case he found slime, sand, water—and the pieces of a violin,” the report said. Jacobsen died in 1972 in Los Angeles. Thirteen years later, Sotheby’s tried to auction the Red Diamond for $1 million, but a sale did not occur until a few years later when an anonymous collector bought it for an undisclosed sum.